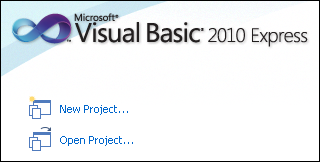 Okay, so we’re going with Visual Basic.NET…this section explains what it’s about and how you can get and install your own copy. The initial download is small (~3mb) but during the install it will download the files it requires from the Microsoft servers. From memory it will download something in the order of another 200mb so just be aware of this! Once you’ve installed VB.NET (which is relatively simple compared to some installs) you will be required to register your product. This simply involves setting up an account and giving some details in order to get a registration key…it’s no big deal. Now you should be ready to open up VB.NET and we can move on. If you’re having trouble installing it, then post a comment down the bottom and I’ll get you sorted.